Marisa is a Postdoc at the University of Pennsylvania. She is particularly interested in study Supernova Cosmology, as well as being a DES Observer. After I visited the Kennedy Space Center, aged 5 and a bit! And I loved looking at the stars in our back garden! The sense of awe and wonder at the Universe in which we live, the sense of setting out into the unknown to discover the secrets of the Universe. I’m motivated by a deep and abiding faith in God. Contemplating the cosmos raises big questions about the purpose and meaning of our lives. I think that these questions only find their true answers in the light of Christ. I believe that God made the Universe, and he made it good, we don’t know how he made it – that’s a question for the scientists! But we do know a bit about why he created it: God created the Universe to be lived in and enjoyed by us – the whole human family, who live together on this small, fragile planet Earth. God made each person out of love, and for me it is really important to recognise that every single person is precious in the sight of God and must be treated with respect, dignity and love. As a scientist I feel specially privileged that I am able to share in this great adventure which is the exploration of our Universe which God created. I love sailing and have sailed all my life. When you’re out at sea, a long way from land, sunset, sunrise, the position of the moon and it’s effect on the tides all become really important, as do the weather patterns. You really feel closely connected with nature. One of my best viewings of the Milky Way was sailing across the North Sea from Norway to Scotland, it was incredibly dark, miles away from land and we could just see the the stars in the Milky Way shining above us so brightly, it was truly beautiful. Trained by the Royal Navy to be an ace navigator! Follow your dreams! There are lots of different pathways to a career in astrophysics / space science /cosmology. We need good physicists, engineers, computer scientists, educators, outreach officers, geologists, chemists, biologists and even medical staff for the human spaceflight programs. Talk to lots of different scientists and find out what they actually do all day – then chose a path that’s right for you. You’ll need to work steadily and focus on passing your exams, but it’s also really important to make time for family, friends sports and other aspects of your life. I spent 8 months in Lima, Peru, discerning my vocation to consecrated life. 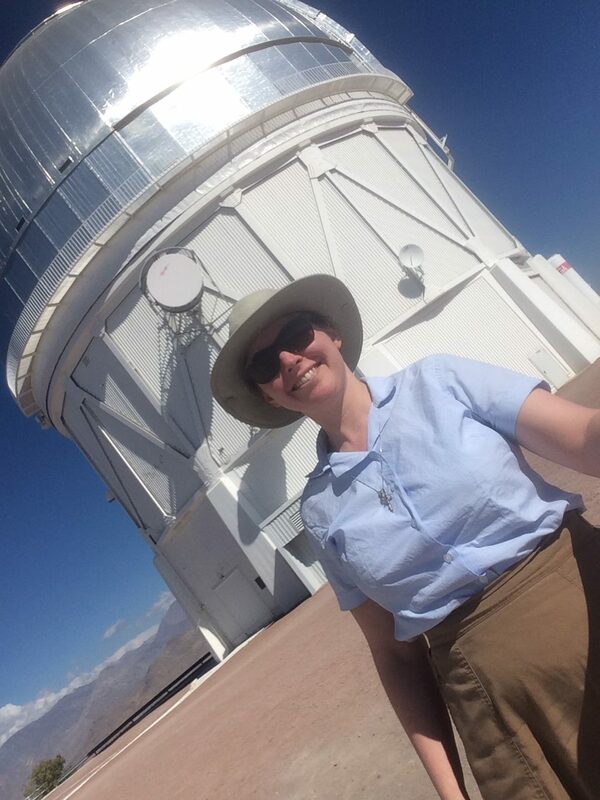 I ended up teaching physics there at Newton College and my students all LOVED hearing about Dark Energy, DES and our observing at the Blanco telescope! They were GREAT students, and I had a great time teaching them! !